World Economic Forum meetings are convened so that leaders can come together to discuss global, regional and industry challenges, discern solutions and catalyse collective action in the spirit of public-private cooperation. The occasion of the 25th meeting of the World Economic Forum on Africa from June 3-5 allows us not only to do this, but also to look back on the many milestones that have been achieved since 1990. By learning lessons from the past, and bringing together the greatest minds of the present, the Forum is committed to acting as Africa’s trusted partner in transformation as it faces the challenges that will shape its future. The World Economic Forum’s first Africa meeting takes place in Geneva, featuring a multistakeholder cast of participants from business, government and civil society, including many ANC leaders. The success of the meeting launched a global roadshow – led by Barend du Plessis, then Finance Minister, and Thabo Mbeki of the ANC – to gain international support for South Africa’s future. This was the first time that the entire South African political spectrum was united behind a common cause. The second Geneva Meeting on Southern Africa takes place under the theme “Opportunities for Growth and Development in a Southern Africa in Transition”. South African President F. W. de Klerk meets with Nelson Mandela and Chief Mangosuthu Buthelezi at the World Economic Forum Annual Meeting 1992 in Davos, Switzerland. This was their first joint public appearance outside South Africa and a milestone in the country’s political transition. 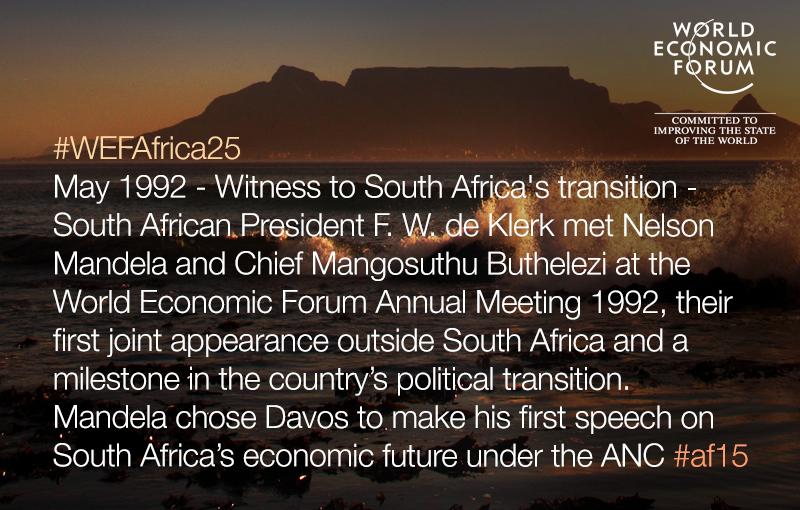 Mandela chose Davos to make his first speech on South Africa’s economic future under the ANC and credited the occasion with inspiring his reversal of ANC policy on nationalization of the mining industry. 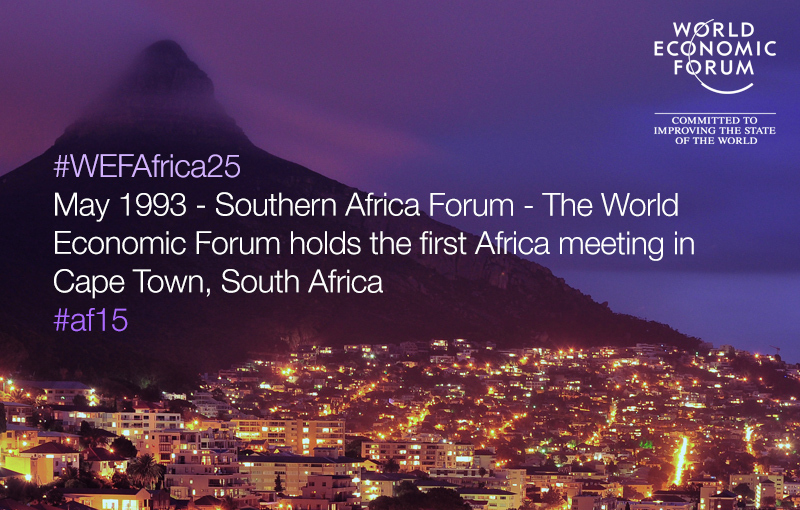 The World Economic Forum holds the first Africa meeting in Cape Town, South Africa. This was the first visit to South Africa for many Southern African Development Community heads of state. The Forum launches a new community in response to a perceived need for a new approach to global leadership. Selected for the inaugural class in 1993 was South African politician Cyril Ramaphosa, current Deputy President of South Africa. The community ran successfully through 2003, during which time many notable African leaders were honoured, including Patrice Motsepe, Founder and Executive Chairman, African Rainbow Minerals, a Co-Chair of the World Economic Forum on Africa 2015; and Winnie Byanyima, Executive Director, Oxfam International, who served as co-chair at the Forum’s Annual Meeting 2015 in Davos. South Africa, Joaquim Chissano of Mozambique, Robert Mugabe of Zimbabwe, and Ali Hassan Mwinyi of Tanzania. 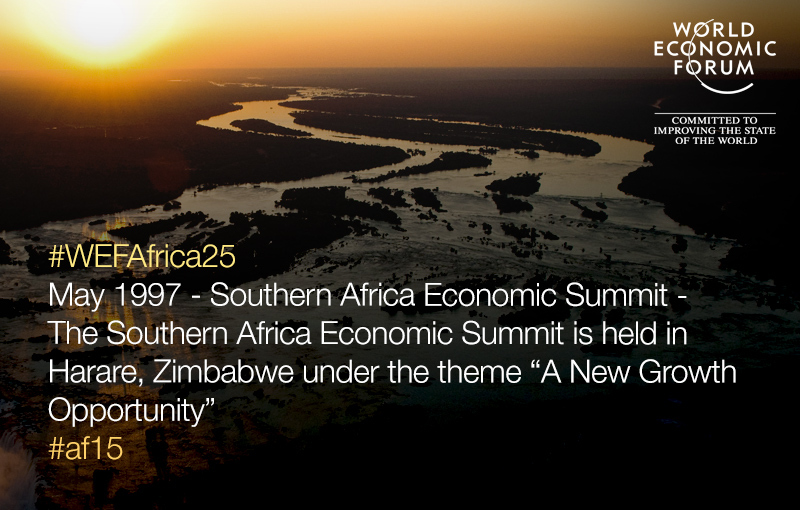 Southern Africa Economic Summit takes place in Johannesburg in the wake of the peace agreement in Angola. the South African public-private sector in marketing itself and to provide assistance, where possible, to SADC. The Southern Africa Economic Summit is held for the first time outside South Africa, in Harare, Zimbabwe, under the theme “A New Growth Opportunity”. Nelson Mandela delivered a special address. The Southern Africa Economic Summit is held in Windhoek, Namibia, under the theme “Southern Africa Priorities for Global Competitiveness in the 21st Century”. The first Africa Competitiveness Report is launched at this summit. 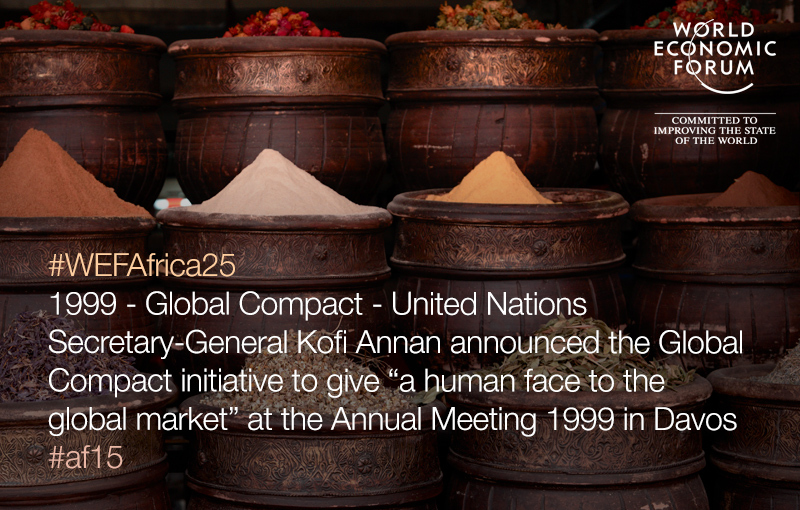 At the World Economic Forum Annual Meeting 1999 in Davos, United Nations Secretary-General Kofi Annan announces the Global Compact initiative to give “a human face to the global market”. At the World Economic Forum Annual Meeting 2000, World Health Organization Director-General Gro Harlem Brundtland announces the Global Alliance for Vaccines and Immunization (GAVI) — a public/private partnership to tackle the lack of systematic immunisation programmes in developing nations, many of them African. Held in Durban, the summit aimed to give economic impetus into the African Renaissance concept and pursue regional integration priorities. Among the participants were Presidents Thabo Mbeki of South Africa and Joaquim Chissano of Mozambique, Vice-President George Saitoti of Kenya, and delegations from Uganda, Ghana and Nigeria. Then-First Lady Zanele Mbeki of South Africa joins the founding board of the Schwab Foundation for Social Entrepreneurship. Among the inaugural class of Schwab Foundation Social Entrepreneurs selected in 2002 was Kenyan-based KickStart International and, between 2003 and 2006, several more highly acclaimed African social enterprises joined the network, including Riders for Health, Lifeline Energy, the Mobility Aid Center, CAMFED, and more. Zanele Mbeki remains an active board member to this day. Business Endorsement of NEPAD. Thereafter, the business community is represented by the NEPAD Business Group. The Africa Economic Summit takes place in Durban, South Africa, and turns a spotlight on the business challenges of Africa’s own plan, the New Economic Plan for African Development (NEPAD). The Africa Economic Summit is held in Maputo, Mozambique, under the theme “Aspirations over Africa’s Future”. In 2004, the Forum also publishes the book ‘South Africa at 10’ to celebrate a decade of democracy in South Africa. A new community, the Forum of Young Global Leaders, is launched, with 16 Africans included in the inaugural class. 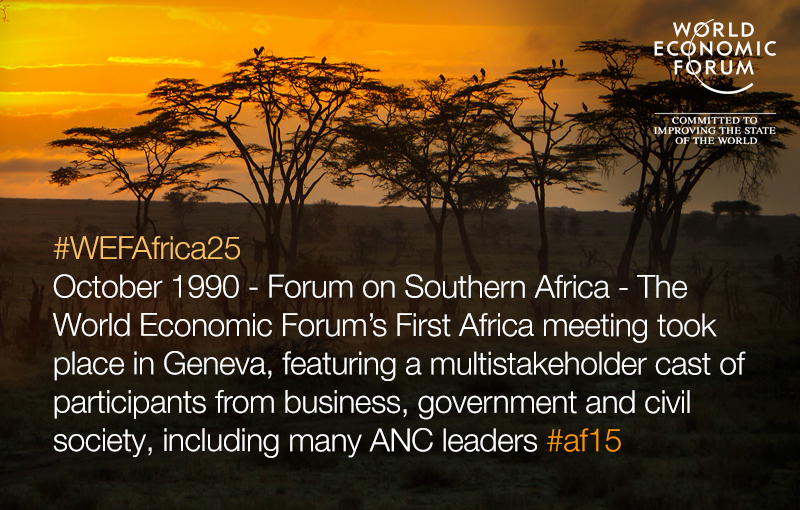 Five of these go on to take part in the Forum’s Africa Economic Summit in 2005. The Global Plan to Stop Tuberculosis (2006-2015) is launched by Nigerian President Olusegun Obasanjo, Microsoft Chairman Bill Gates and UK Chancellor of the Exchequer Gordon Brown at the Forum’s Annual Meeting. The project – a coalition of over 400 organizations – aimed to treat 50 million people and prevent 14 million tuberculosis deaths worldwide over a 10-year period. Also announced in Davos the same year is the Business Alliance Against Chronic Hunger. With government and civil society partners, the Alliance’s aim was to deliver scalable, market-based solutions to the persistent problem of hunger in Kenya. During the World Economic Forum on Africa in Cape Town, the Investment Climate Facility for Africa is launched as a public-private partnership trust focused on removing barriers to private investment in Africa. announcement is made in a plenary session on Investing in Growth. AGRA was singularly recognized as an effective public-private partnership for improving smallholder farming in the G8 in 2008 and 2009.
have significant operations across African countries. partnership initiative of the Alliance for a Green Revolution in Africa (AGRA). Under the theme, “Capitalizing on Opportunity”, African leaders at the 18th World Economic Forum on Africa focus on raising the quality of leadership and education to capitalize fully on the growing opportunities available, thanks to strong economic growth and the significant decrease in conflict. An initiative by four World Economic Forum Young Global Leaders ‒ Michael Kremer, Kristin Forbes, Sriram Raghavan and Esther Duflo ‒ is launched in Africa, aimed at providing anti-parasite medicine to students in Kenya. The initiative grew rapidly, earning praise from the development community for its effectiveness and support from the government of Kenya, allowing it to reach millions of schoolage children. In 2013-2104, Deworm the World was able to treat 37 million people in India and Kenya, and in 2015 launched a programme to treat children in Ethiopia. At the 40th World Economic Forum Annual Meeting in 2010, Bill and Melinda Gates, Co-Chairs of the Bill & Melinda Gates Foundation and Founding Partners of the GAVI Alliance, pledge $10 billion to vaccinate over 8 million children in the next decade. A large percentage of these funds were directed towards vaccinating African children. incorporate small-scale farmers. At the launch, USAID Administrator Rajiv Shah announces a $2 million investment into the corridor’s $50 million Catalytic Fund. The 20th World Economic Forum on Africa is held in Dar es Salaam, Tanzania, under the theme “Rethinking Africa’s Growth Strategy”. The meeting convenes 13 African heads of state and over 1,000 participants from 85 countries. It also marks the first time that the Young Global Leaders choose Africa as the host region for their Annual Summit. public-private partnership supported by the Forum and the International Finance Corporation, announce a Declaration of Partnership, recognizing the critical role that water plays as a catalyst for economic growth and social development. The meeting also saw the launch of the YGL Dangote Fellowship to support the participation of African YGLs at World Economic Forum events, as well as the first time sessions were webcast on the Forum’s public website. infrastructure development in Africa and accelerating the Programme for Infrastructure Development in Africa (PIDA). expanded rapidly in Africa, establishing at least one hub in every country by 2013. Today, the number of hubs active in sub-Saharan Africa exceeds 80.
by expanding the pool of foreign and domestic capital available for sectors including infrastructure, agriculture and energy. Also at the meeting, Nigerian business leaders join forces with the UN Special Envoy on Global Education Gordon Brown to launch a $20 million Safe Schools Initiative aimed at creating safer learning environments in the country. Annual Meeting 2015 in Davos. The AELG’s first move is to create a working group of African leaders including Tony Elumelu, Aliko Dangote, President of the African Development Bank Donald Kaberuka, Prime Minister Daniel Kablan Duncan of Côte d’Ivoire and President John Mahama of Ghana.